1. Through a political/legal regulatory reform lens. 2. Through a grassroots economic development lens. and re-re-reform. The Tar-baby (a life-like form concocted of sticky pitch and tar by the wiley Br’er Fox) seemingly refuses to answer Br’er Rabbit’s friendly greetings; and every time the indignant Br’er Rabbit takes an angry swipe at the Tar-baby , “His fis’ stuck, en he can’t pull loose. De tar hilt ’im”. In a similar fashion progressive activists may get all tangled up in the political system’s recalcitrance, filibustering, and perpetual resistance to reform. Hard-fought legislative reforms could even theoretically become counter-productive if they imposed redundant regulatory compliance burdens on green, worker-owned cooperatives whose charters, bylaws, and worker enfranchisement begat enlightened self-management in the first place. Green fair-enterprise is an exercise in the progressive framing of economic issues. The Right wants to label progressive economic ideas as socialism, government take-overs, totalitarianism, communism, Marxism, and worse. At the same time, our opponents characterize themselves as libertarians and free-market, free-enterprise capitalists. But in fact, they actually hate competition and attempt to dominate markets by any means possible. This includes monopoly power and capturing the political process with concentrated wealth and influence. The paleo-corporate world does not believe in sporting competition using Marquess of Queensberry rules. In reality they believe only in economic warfare in which the competition is literally or figuratively murdered. They also falsely claim to support “family values” while they actually seek to enslave workers and strip them of their civil rights, their human dignity, and of all protections of health, safety, and financial security. At the same time, classical top-down, command-and-control versions of socialism have rightly been abandoned by the left in favor of democratic and participatory forms of economic development. What has been slower in capturing the imaginations of many progressives is the importance of radical diversity and localization in economic democracy. Economic democracy is at its core a grassroots movement. That grassroots movement may include a national reform agenda, but even more fundamentally it MUST include a reverence for local and individual self-determination. Forward thinking progressives must not join their right-wing corporate foes in asking modern, liberal societies to surrender their freedoms in exchange for security and prosperity. On the contrary, the progressive community must step up to the modern challenge of finding methods to increase prosperity, freedom, civil rights, and human dignity, all at the same time. And it CAN be done. The appropriate ideas and methods DO exist. One framework for reconciling these values and methods, the peer-to-peer (P2P) framework, was introduced by Michel Bauwens at the TEDx conference in Brussels. Much of the language of politics, economics, and sociology that I grew up with my be outliving its usefulness. Words like capitalism, socialism, anarchy, liberalism, etc. 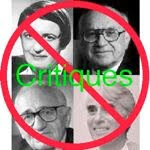 (and all their “neo” versions) may have been beaten to death in the public imagination and/or may conjure up too much historical baggage to sort out, even within the center-to-left, progressive community. Mr. Progressive says: Grassroots economic development, economic democracy, peer-to-peer, open everything, diversity, localization, self-determination, etc. are all consistent with an old liberal idea: the idea of free-enterprise. Not the fake, bait-and-switch kind of “free-enterprise” of monopoly capitalists which is only a euphemism for market deregulation, anarchy, and corporate take-overs. The free-enterprise I’m talking about is the real deal–open, local, diverse, human-centered, worker-centered, democratic, socially just, and sustainable. That’s why I call it GREEN FAIR-ENTERPRISE! I think the green meme and the fair-enterprise meme still have value and meaning in the public imagination, at least in the US. The protection of both workers and consumers from corporate exploitation is the core principle of green, clean, socially just and sustainable fair-enterprise: cooperative worker ownership and consumer ownership of local, national, and multinational businesses. This requires no legal reforms and we need not borrow from any “foreign” political or economic theories. The US has a rich tradition of employee ownership, worker-ownership, and consumer ownership of economic enterprises. As long as any given legal framework protects the freedom of paleo-corporate enterprise to act as it wishes, that same framework will confer the same latitude to green fair-enterprise. No differential treatment is required. No tax exempt status is required. Co-operative businesses that redistribute income to the members and book no net profit are tax-free under for-profit rules because ordinary businesses are taxed only on net income, not gross revenue. Therefore frantic, defensive efforts to reform the status quo do not need to sap so much of the time and resource base of the progressive community. More emphasis can be shifted to our creative, pro-active efforts to organize and grow a green economy under the existing legal regime. This is a key point. I believe in pragmatic, experimental diversity, not in ideological purity. The modern intellectual context is empirical, pragmatic, eclectic, and interdisciplinary. All the old stovepipes and sandboxes of scholarship and science have to be merged. The old jargon in each specialty is similar to the incompatible database structures across different institutions. Thinking and acting outside the boxes may be retarded by old categorical cliches like “public” and “private”. Look what The Nature Conservancy accomplished by doing something new under existing laws. It just so happens that our legal framework in the US is open to all kinds of business structures (including non-profit) and forms of ownership (including worker-owned and consumer-owned). Our biggest problem is not some bias in the law, real or imagined, against progressive values and ideals. The biggest problem is our habitual cognitive bias and our voluntary dependence on paychecks and benefits from the state or from corporate capitalist exploiters. In voluntary servitude we lay our labor at their feet in return for a few scraps from their table. They have us convinced that if we want change, it can only come through political struggle. That is the ubiquitous myth and we succumb to its spell. But the occult truth is that we can build any kind of workplaces and institutions we might envision in our dreams, entirely outside of the political process and outside of the corporate stables. As twenty percent of the population we have far more potential power in our skills, our imaginations, and in our wallets that in our votes. Tragically, instead of seizing the natural birthright of the fruits of our own productivity, we huddle like feudal serfs and wave our pitchforks and torches at ancient castle walls, demanding justice and fair play from the Money Moguls, Robber Barons, High Sheriffs, dark-robed Judges and Evil Lords holding court in the high towers above us as well-armed convoys and fleets of Black Knights Templar transport fabulous treasures to and from undisclosed off-shore bank vaults. By working for the bad guys and then turning around and spending most of our pay at what amounts to the corporate company store, progressives are enabling the enemy. Most white and blue collar workers are mindlessly participating in a share-cropper economy. 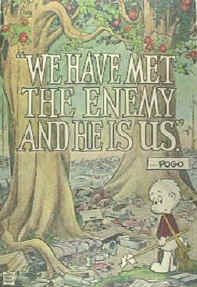 As Walt Kelly’s character Pogo famously said, “We have met the enemy and he is us.” We need to stop enabling the enemy and start empowering ourselves. The progressive community (perhaps 15 to 20 per cent of the US population) can, as I like to say, “circle the wagons”–that is we can invest more time and resources within the progressive community to build all the kinds of fair, safe, sustainable, right-sized, co-operative and synergistic social and economic infrastructure(s) that people of reason and good faith can conceive. (Of course much of the inventing was already done for us back in the old rural co-operative days–the days of farmers’ co-ops, rural electric co-ops, telephone co-ops, and such, and in the early urban America where exploited workers formed the first trade unions, credit unions, and other mutual-support societies). About 30 percent of farmers’ products are marketed through co-ops and there are more than 3,000 farmer-owned cooperatives in the U.S. Almost 10,000 credit unions provide financial services to approximately 84 million members. Nearly 1,000 rural electric co-ops operate more than half of the nation’s electric distribution lines and provide electricity to more than 37 million people. More than 50 million people are served by insurance companies owned by or closely affiliated with co-ops. In total, 47,000 co-ops in the United States serve 130 million people — 43 percent of the U.S. population. Two million U.S. households receive telephone service from telephone cooperatives across the country. By taking the direct economic self-development path, as many Argentine workers did after the economic collapse of that nation, and as many of our other South American neighbors are doing, we can help to insure the future security of our country, reinforce our progressive social values, and offer a dignified way of life with the greatest measure of liberty, equality, opportunity, and security for all. Why wait for an economic collapse when by a simple shift of of our collective social and economic weight to the “other foot” we might preempt the kind of economic collapse that many nations have experienced and which many more still fear? The progressive community is large enough to accomplish this on our own if we collectively marshal our resources to that end. We can build suspension bridges and global internets one-handed if we are working under the watchful gaze of “the man”, so why do we seem to slump into a veritable productive stupor when we stray outside the time-clock-punching, florescent-light-flickering, cellular-ring-tone-bleating structure of the corporate environment? Could it be the constant media drone, the educational mesmerism, and the non-stop cultural monotone that’s been fed us from early childhood that has put the warrior in us to sleep? What kind of pots and pans banging will it take to bring us back to our senses and into the streets? In response to the economic crisis in Argentina, many Argentinian workers occupied the premises of bankrupt businesses and began to run them as worker-owned cooperatives. As of 2005, there were roughly 200 worker-owned businesses in Argentina, most of which were started in response to this crisis. In the documentary The Take director and journalist Avi Lewis and writer Naomi Klein (author of the international bestsellers No Logo and Disaster Capitalism), champion a radical economic manifesto for the 21st century with examples from Argentina. The Chávez government in Venezuela has a policy of financing worker cooperatives, resulting in a growing number in that country. Working first from the basic needs of the people will inspire them to participate. We also work with them to think more about the future, how we can improve things over the long term. There is a network of promoters of the comunas that coordinates, but the participation of the people is fundamental. There are people of all kinds that participate in the comuna: people from the left, people from the right, people that don’t care about anything. The people get involved with a problem that touches their family, the school for example because it involves their children. Without waiting for the old economy or the political state to be reformed we can start to shift the weight of our progressive labor and capital resources towards the development of small cooperatives and cottage industries in renewable energy, organic food, green manufacturing, transportation and construction, ethical banking, humane and affordable insurance, and any other area where there is a niche amidst the social needs and market demands that our worker-owned enterprises can fill. “The Co-operative Group is the UK’s largest mutual business, owned not by private shareholders but by over six million consumers. The Group operates 4,800 retail trading outlets, employs more than 106,000 people and has an annual turnover of more than £13bn. It is the UK’s fifth biggest food retailer, the leading convenience store operator and a major financial services provider, operating The Co-operative Bank, Britannia and The Co-operative Insurance. Among its other businesses are the number one funeral services provider and Britain’s largest farming operation. As well as having clear financial and operational objectives, the Group has also set out its social and sustainability goals in its groundbreaking Ethical Plan, which specifies almost 50 commitments in these areas. The corporate state will put up obstacles to green fair-enterprise, of course, (they are quietly doing that all the time via the convoluted and anti-competitive laws that industry lobbyists ghost-write for Congress), but every profit-driven small businesses and right-wing entrepreneur will scream bloody murder if the bar is raised too high for them. If those turkeys can jump through the hoops, we can, too, with the right kind of progressive organization and support. Mr. Progressive says: There are so many millions of people turning progressive that there is probably already a critical mass in half the counties in the country if there were just some existing organization(s) that could serve as a clearing house for expertise on starting a wide range of worker owned coops–a national clearinghouse with a coop “incubator” approach. The critical kickoff play is finding or recruiting a good-sized organization like the Sierra Club, let’s say, that can dedicate some resources to serve as the nucleus of a clearinghouse/incubator for all kinds of worker-owned start-ups and strategic buy-outs of existing business that may be struggling to keep above water in the current economy. The incubator needs to combine cooperative financing, insurance, and technical assistance. All our cities and towns should have hundreds of coops in many market sectors. A big one would be clean/green energy. We should have solar energy coops (including solar-thermal power stations and distributed photovoltaics OEM//installers) patterned after the old rural electric coops, and ethanol coops patterned after farmers coops but using cellulosic and waste feed stocks and producing feed & fertilizer byproducts. We should have mobile phone, computer tech, and electronics coops. Also coop farmers’ markets, community supported agriculture, and community garden coops.. One of my favorite ideas: A Green Coop Mall with all kinds of retail and service coops sharing facilities, marketing, financing, etc. 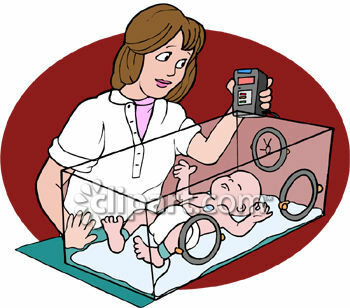 That can also include a coop incubator. The opportunities are endless, and this is the way to build a progressive, democratic counter-economy that would provide a permanent economic base for our political movements. There are already some worker-owned coop support and incubation efforts in the US. One is the U.S. Federation of Worker Cooperatives headquartered in San Francisco. There are numerous other links to organizations that promote worker-owned enterprises in the Wikipedia article on worker cooperatives. What we still lack is an adequate national umbrella and a flagship organization to head the networking effort. In Venezuela the national government has provided that infrastructure. In the US progressives can not afford to wait for the government. We can pressure our political representatives on this issue, but that is not enough. We need to pressure all our progressive organizations to adopt the green fair-enterprise agenda and to actively join the networking and incubating efforts for progressive green fair-enterprise in the private sector. That is really what direct economic democracy and participatory economics is all about. Many people think of co-ops as the hippie-dippy grocery store that sells organic goods. In fact, a 2009 study by the University of Wisconsin Center for Cooperatives found more than 29,000 cooperatives in the US, which make $500 billion in annual revenue, support 83,000 people, and pay $25 billion in wages and benefits. Through our P2P lens (at the technical level) and our green fair-enterprise lens (at the popular culture level) we can see ahead to a time when conventional government is shrinking (just as many conservatives and libertarians hope it will, thinking that will mean greater freedom from taxation and regulation for them) and the paleo-corporate dinosaurs are also gradually fading into history. At the same time, we will have a diverse, P2P, green fair-enterprise system growing up beneath the old corporate state’s thinning branches, slowly and organically from the grass roots. Unlike the old corporate state, the progressive community doesn’t see less government as more net freedom from rigorous regulation because the progressive community is eager to regulate itself rigorously from within, in a decentralized way full of organic checks and balances, according to ever-higher standards of design, social justice, and environmental stewardship. Progressives, lets start to circle the wagons now, start investing more time, energy and capital inside our own green, progressive, p2p circles, ease off on some of our struggles with the old corporate-state Tar-baby , pull out the 24-hour-a-day intravenous news feeds, and for the time being, completely ignore the fake Tea Party Indians running around out there in the weeds! The Rochdale Principles are a set of ideals for the operation of cooperatives. MONDRAGON Corporation homepage The largest cooperative in the world. The Co-operative Group is the UK’s largest mutual business, owned not by private shareholders but by over six million consumers. It operates 4,800 retail outlets, employs more than 106,000 people, and has an annual turnover of more than £13bn.